Builders with a mission to build, improve and expand living spaces for Londoners. Creating spaces that are finished to the high standards, comfortable, and practical is our joy. Our company feels proud to leave owners with a home they love. With a track record of delighted customers across London, we are on the lookout for the next challenge. Established in 2011 as a construction arm to an architectural practice, AFL Construction quickly outgrew its origins and became independent. We also offer a full package of build, design and management. We provide a free detailed quotation and initial consultation, which we explain in basic English to make it clear and easy to understand, as some of our clients might not been previously involved with building works. After our office team accepts the quote , we provide our clients with a written contract as well as a program and duration of the project. We take the payment when the work has started and provide clients with weekly reports of the accomplished tasks. We hold Public Liability and Employers insurances. As every project has defects liability period, we can obtain additional insurances for works. AFL Construction ensures testing and certifying of Gas and Electric installations. If the project is subject to building control we will liaise with building control surveyor to ensure the project complies with Building regulations. If you are unsure, we are always ready to provide professional consultations, including those of architect, structural engineer, planning and design for a reasonable charge. AFL Construction is a member of the Federation Master Builders (FMB) and abides by the FMB Code of Practice. Being a member of FMB shows that we take pride in the quality of our work and we match it with an equally well-run business. AFL’s core team consist of experienced and qualified construction managers, tradesman and an office support team. All our tradesman know their work and supported by Gas Safe registered engineers and NICEIC approved electricians. We put emphasis on planning and timely reporting, as well as communicating with all involved parties. Employing AFL Construction ensures successful completion of your project with focus on quality and efficiency. Thanks for all your help, support and advice throughout the project. I know we had our issues and differences at times, but I am very grateful for all that you and your team did for us at our home. I can’t believe we’ve been there for a year now! We are really pleased with all of the work AFL provided and are really happy with our new home. Thanks for everything, and all the best for the future. 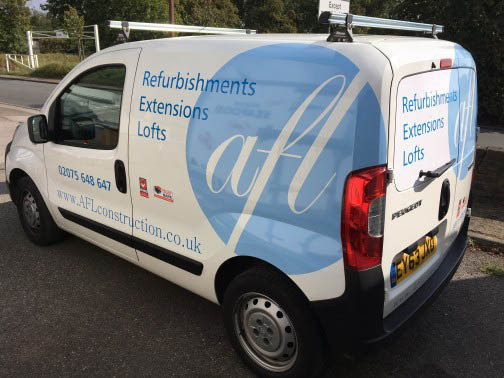 Since the beginning of the year AFL have done a lot of work on my flat and I am incredibly pleased with the results – and genuinely enjoyed working with the team at AFL. From the initial meeting they take the time to understand what you are looking for and are very accommodating in delivering it – with helpful advice and input from start to finish. Communication throughout the work is brilliant, as is management of payments and any concerns – excellent level of customer interaction and care. And of course, the results are great – I am incredibly pleased. I really recommend working with Andrew, Sigita, Tomas and the team. I will definitely be working with them again in the future. We are all so pleased with our new home, and delighted we chose AFL. We’ll be back for more of your special craftsmanship early in the new year.